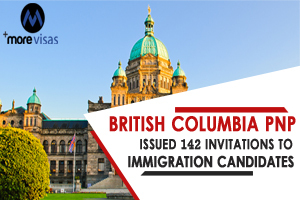 British Columbia Immigration has extended its weekly British Columbia Provincial Nominee Program draws by announcing 142 invites over five provincial streams. The Apr 10 draw highlighted lowest required scores varying from 75 up to 105 points. Workers in Entry level and semi-skilled demanded the least score of 75 points, correlated to a 95-point least score for skilled workers in the direct provincial stream. Applicants with the remaining 03 streams – for Express Entry international graduates and skilled workers plus straight provincial international graduates all the streams demanded the lowest score of 105 points. British Columbia’s former draw came by the Tech Pilot stream in British Columbia PNP. The April 2 B.C immigration draw observed 26 invitations announced to applicants with required experience and targeted skills in 29 target professions. By the straight streams of British Columbia Provincial Nominee Program, skilled workers attended the lowest score of 94 points, while international graduates demanded 100 points to be eligible. Below B.C’s Express Entry associated streams, the lowest required scores were 105 for foreign graduates and 100 for skilled workers. Ultimately, workers of entry-level and semi-skilled demanded the lowest score of 73 points. The PNP of British Columbia's Tech Pilot has been also extended into the year 2019 after its primary launch in 2017. Now it has a list of 29 target professions with comfortable duration demands. PNP of British Columbia draws explicitly pointed at technology workers commenced in May 2017. The province has a booming technology industry with surprising big names of the technology world depending themselves in the western Canadian province.